Celco Circle Templates are made from a flexible clear plastic and range from 20 to 36 circle sizes. This product is a must have for any one in technical or architectural design. 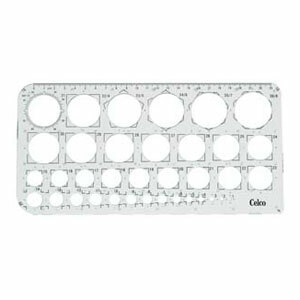 #C67 Circle Template - 20 circles 3mm to 28mm diameters, milimetre and inch rulers. #C68 Circle Template - 36 circles 1mm to 36mm diameters, Ink boss risers for use with ink pens.